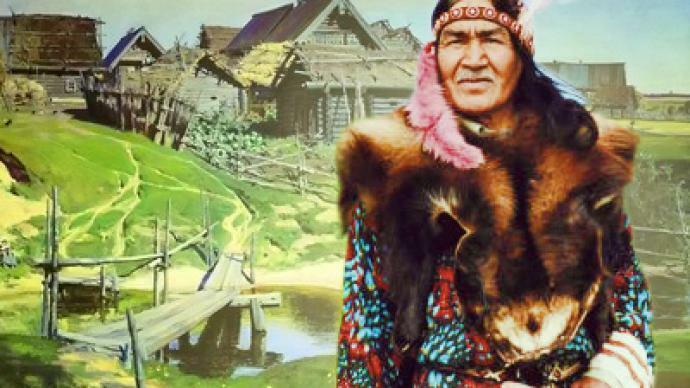 It could have been a simple love story, but when Native American Justin Irwin moved to a small village in central Russia to be with his Russian wife, his defiance of distance and tradition drew the attention of everyone. ­Like in many small Russian towns, there are more people leaving than coming to the village of Slavtsevo, located in the Vladimir region. With the population dwindling as young people head for cities to work, it was a true wonder when Justin Irwin left his home on the Lakota Indian reservation in South Dakota in the US to begin a new life in Slavtsevo. Life on the Lakota reservation, as in Slavtsevo, is not easy. Economically blighted despite stimulus package funds, the unemployment rate is among America’s highest, with one-quarter living at or below the poverty line. Before he met Natalya, Justin had resigned himself to settling there indefinitely. Interest in Native American culture sparked a friendship between the two on an online forum. Justin was there debating the Lakota future, while Natalya wanted to learn more about traditions hugely different from hers. Their friendship grew and six months later Justin invited Natalya to volunteer on a project in the US. For Natalya, a single mom at the time, the adventure led to love, marriage and a second child. And for Justin, it inspired him to pack his bags and, as he put it, follow the Great Spirit. However, it seems to be more than love that keeps him in Slavtsevo. Despite the picturesque scenery, the simple way of life can be tough. People still draw water from a well and chop wood to stay warm. But Justin says what the community lacks in conveniences, it makes up for in warmth. “You’ve got people who actually care about each other, actually help each other and think about other people before themselves,” Justin said. And once locals got over the initial surprise of a distant newcomer among them, they quickly accepted their new interracial and intercultural family. “I am very happy for this young couple,” said Raisa Stepanova, a local resident. “I communicate with them. I am always glad to see them at my place, and I am trying to help them with what I can”. Justin hopes that life on the reservation back in Dakota will improve so he might return one day with his family. But for now, it seems there is no place like his new home.